Instead of synthetic rubber, we have now used the softening process with a natural rubber. This is slower but affords maximum grip. The extra softness ensures that the ball enjoys a larger "sweet spot" when making contact with the rubber. The result is more backspin, longer contact and optimum ball control. Perfect for defenders. Also highly suitable for all-rounders who require the best possible grip and control. 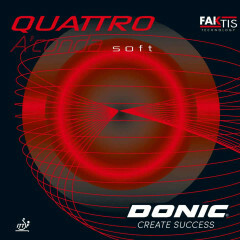 Donic Rubber Quattro Aconda soft is beeing added to cart.